The purse strings of the British Motor Industry may be pulled from abroad these days, but based on the offerings at the 2010 Paris Motor Show, Blighty is not just alive and kicking, but taking centre stage. Here’s a patriotic rundown of what’s on offer from our side of the Channel. Lotus, usually a bit leftfield with their business strategy, have not disappointed this year. Rather than stretch out their share of the limelight beyond one motor show they chose Paris 2010 to unveil not one new model, but five. You have to admire the ambition of this bold new strategy, even if you do temper that with slight concern that new CEO Danny Bahar is trying to take on the world a bit too soon. All but one are tantalising prospects, and have been penned with a sharp, technological style. The new Esprit, due in 2013 is pitched by Bahar as ‘the ultimate supercar’. And so it should be with a mid-mounted 5.0 V8, 611bhp and polished Lotus handling. Their make or break car – the new Elise, will be out in 2015 – some 20 years after the iconic original broke cover. Seems a long time to wait for such a crucial new model, but then Lotus let the Esprit soldier on for decades, and it was at its zenith when they pensioned it off. Plugging the gap between Elise and Esprit will be the Elan, due out in 2013 – 444bhp and less than 1300 kilos should give it a useful advantage over the cooking 911 Carrera rival. There’s also the Maserati Granturismo rivalling Elite, a 2+2 GT sharing the 611bhp lump from the Esprit, due in 2014. Now pause for breath. Last, and possibly least, is the Eterne which noses right into Panamera/ Aston Rapide four-door supercar territory. I want that last one to work, but I think maybe Lotus are stretching themselves one niche too far. 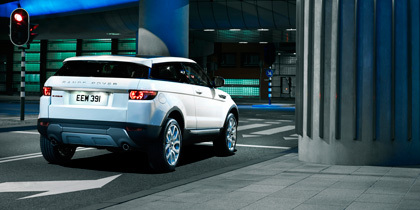 Jaguar Land Rover revealed the Evoque for the first time in the metal, their ‘baby’ Range Rover. The pictures reveal an impossibly high waistline, and tapering glass house that lend it a menacing stance. To these eyes it’s a desirable looking machine, but you may want to tick the parking sensor option given the letterbox sized rear window. With a mooted starting price around £30k attached to a name as aspirational as Range Rover it is surely destined to sell as fast as they can make it. But with manufacturers raiding endless niches and often inventing new ones in the pursuit of a greater slice of the pie, I can’t help but wonder whether doing the Russian Doll routine with Land Rovers’ crown jewels is going to dilute the brand. Jaguar celebrated its 75 year milestone in style by pulling the covers off their XK sized C-X75 concept. Overall, visually arresting but paying homage to Jaguars’ past, the front end treatment signposts Jaguar’s new design language. In Jaguar PR-speak it’s a ‘range-extended electric two seater supercar’, and they aren’t kidding – theoretically it can manage a zero tailpipe emission range of 68 miles and a faintly outrageous 205mph. This is when running solely on battery power to drive the 195bhp electric motors sited at each wheel. It also employs mid-mounted micro gas turbines producing 188bhp, to either charge the batteries and extend the range to a monumental 560 miles, or to provide additional power in ‘track’ mode. So – 205mph, 0-60 in 3.4 seconds and a Co2 figure of just 28 grams per km on the EU test cycle – welcome to the dawn of the socially responsible supercar. Nothing totally new here, but if you are orange and live in Alderley Edge, listen up. It’s almost seven years since Bentley launched the Continental GT, and whilst they haven’t unveiled a ground-up new model, they’ve given the old girl a face-lift, sharpening up some of the blobby edges. It’s altogether a more agressive and muscular look, with a re-profiled front end, more upright grille and tighter rear haunches. They have also reworked the W12 power plant, which now pushes out 567bhp and 516lb ft of torque. Bentley will hand you the keys to a new Conti GT in exchange for around £135k. It’s impossible not to notice a shift in the language used by these car companies – talk of ‘propulsion systems’ where once you would have expected to hear ‘engine’ or ‘drivetrain’, signpost the re-birth of what has been seen as a declining industry. For someone hooked on the noise, smell and oily goodness of the internal combustion engine, it feels like the motor industry is gradually closing a door on fossil fuel power. It’s been hard to want to get fully behind this shift in priorities, even though the industry had to change to appease legislators and politicians . But Jaguar is reinventing itself and proving that when one door closes, another one opens. The C-X75 may be just another mouth-watering concept, but it showcases Jaguars’ fascinating new direction for design and technology and gives a glimpse of the tech we will see trickling down into production models. The future is not going to be filled with dull, anodyne Prius-alike ecoboxes, but 205mph gas-turbine assisted four-wheeled power stations. Can’t wait. End of the road for Overfinch?